A Maiden Stakes (Plus 10) over 6f on Standard going. Nine two-year-olds take part: five colts, four fillies all with race experience. Brother McGonagall is trained by Tim Easterby for the Reality Partnership VI. This bay gelding, a son of Equiano, was purchased for 25,000G as a foal. He raced almost two weeks ago over course and distance. This May foal was a 50-1 shot that day. It was a tough race won by Michael Dods' Holmeswood. Brother McGonagall was ring rusty, slow from the stall, but ran on to finish sixth. He wasn't disgraced. Clearly, this juvenile needs to improve for that initial experience, To be fair he should. On Saturday, David Barron sprang something of a surprise with a two-year-old debutant winning at odds of 33-1. Glorious Politics is a son of Delegator out of Pelican Key who won on debut. This was her only victory. 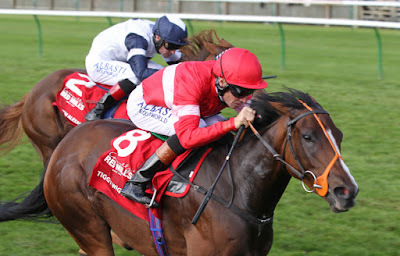 She contesting the Princess Margaret Stakes Group 3 at Ascot although comprehensively beaten. Glorious Politics cost 45,000G at the yearling sales. He ran in a stiff York maiden (back in October) when backed. Held up, this juvenile made good progress to finish sixth beaten less than four lengths. Over fifty days have passed since that racecourse bow. Should improve for that first start & hold claims. Rapid Rise hasn't been seen since early June. Racing in the familiar lime-green silks of John Fretwell, this Irish-bred son of Fast Company ran three times in about a month for David Brown. To be fair, this bay colt ran well on each occasion. Most recently, he was runner-up over course and distance. This February foal has an official rating of 77. It will be interesting to see how this lengthy absence affects this colt. Brown isn't the type of trainer to bring a horse back unless it is ready to roll so another entrant who is worthy of respect. Richard Fahey has a large string of juveniles and an exceptional trainer. Six Strings is a colt who must have been showing plenty of ability on the gallops. He started 9-4 on debut over this course and distance, narrowly foiled by Hyperfocus who edged left and done this son of Requinto no favours. This 50,000E yearling purchase was primed for the Weatherby's Super Sprint at Newbury. Finishing ninth was no disgrace because he was beaten less than six lengths. Considering he carried much higher weight than many of this excellent field that was a fine account. Ann Duffield has Wild Acclaim making his second start after being last seen at Hamilton in a five-runner race. This homebred is owned by Ballylinch Stud although sold at the breeze-up sales for 42,000E. He had a stiff task that day when facing a 30-100f Whirl Me Round who won in ready fashion. Wild Acclaim was struggling out the back until running on in the closing stages to pick up the pieces in second place. It does make me wonder what that race amounted to although El Hombre & Sky Gypsy went on to win. It looks as though this step up an extra furlong will be positive. If priced 13/2 & less SP it would bring further hope. Dealer's Choice drifted markedly in the betting on debut but ran a sterling race pressing Sir Michael Stoute's Panova - five lengths clear from the third. This grey filly owned by J Shack was a touch weak in the betting second start when, after such an encouraging debut, you would have been thinking she had outstanding claims. In truth, it was a fair contest with the winner from Saeed bin Suroor The second and fourth are capable types. Racing keenly in the early stages of the race may well have tamed this juvenile in the closing stages. Punters may be willing to give this attractive grey another chance. Red Mohican is a chestnut daughter of Harbour Watch purchase by Phil McEntee for just 12,000G at the yearling sales. McEntee is no shrinking violet when it comes to opinions and a trainer I have a lot of time for. This little filly ran in a strong race when making her debut. If memory serves, it was one of the first two-year-old races of the season. She showed good pace second start over the minimum distance. May show up with the lead but looks unlikely to figure at the death. Slave To Freedom is best watched. Miss Montes showed little ability on debut and unlikely to figure unless seriously backed. Conclusion: This analysis seems to have an age to write - which doesn't fill me with joy. Please help share this post via the media buttons below as it gives me the incentive to write to a professional standard. This looks a tough race to be dogmatic. I would need an each-way price to even considering betting. The likes of Six Strings & Dealer's Choice seem unlikely to touch those prices. Glorious Politics may tempt a few punters to go for an each-way touch and has fair claims although this may prove to be a difficult race to pin down one horse.